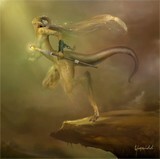 From the Legend Gone http://www.deviantart.com/deviation/9099394/ piece that I did. This is basically a cg colored/effects version of that piece. This had been lingering in my pc and so I decided to go ahead and finish it. 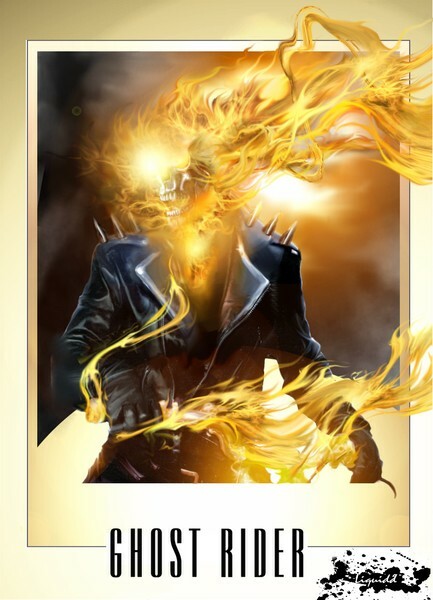 For those who aren't aware, this character is Marvel Comics' Ghost Rider aka Johnny Blaze (not to be confused with Johnny Storm aka The Human Torch). It is a demon spirit (forgot his name), but he's a good guy :confused: Pose reference used in original drawing of a photographed scene from a Marlon Brando film entitled "The Wild One". Very inspirational artwork, if you visit my site you will understand what I mean, I am in the same line, I like making fantasy images and appreciate a good one like yours when I watch it. Incredible version of the vengeful spirit, as good as the movie. How can you sleep at night, creating an image like this?